This is a fancy vegan cake suitable for any intolerance. Word of warning at the beginning, it is full of sugar! So bad news if you are off of sugar or sensitive to it. Otherwise, it is amazing! It was my husband’s birthday this weekend and I gave him some cake options. Of course he picked the most challenging, but in the end it was worth it. So happy birthday to my Schatzi! I hope you felt loved. I’m sure you know that I find baking the most challenging, and often times most stressful, type of cooking. I do it purely out of love because I also don’t want the temptation lying around the house. Lucky for me, I have a German husband that feels right at home in a cake shop in Europe surrounded by ladies having tea. So no baked good stays around for long at our house. I found this recipe on the blog Top with Cinnamon. Izy is an amazing baker and can make things that I can never dream of making. Her photos are stunning as well. 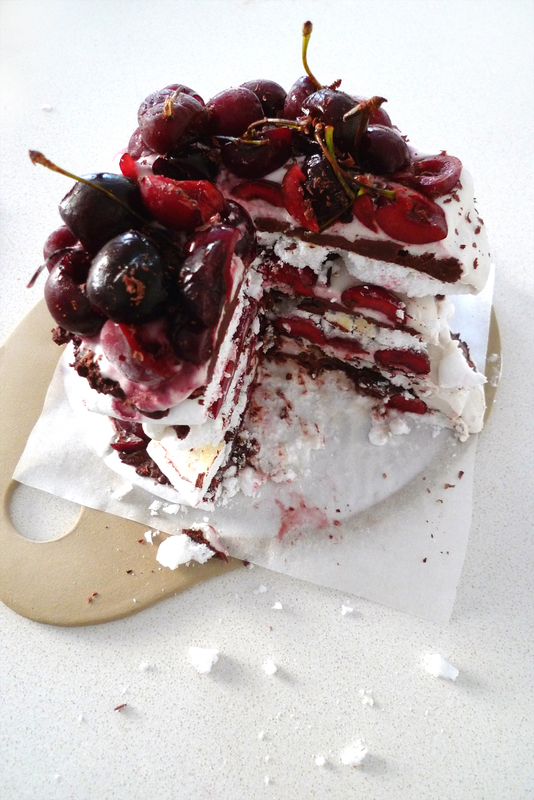 I have adapted her Chocolate and Cherry Meringue Cake to be vegan and PKU appropriate, but as I said, it is still full of sugar. I am quite sensitive to sugar and after only a few bites found myself with the typical sugar fog and headache. Yet it was enjoyed by all; especially the husband and daughter. I have replaced the typical egg whites with an egg white replacer. You can find this at any health food shop and if you are cooking for a PKU diet, you would have found this alongside your medicated foods; however, you can still pick up a vegan one off-the-shelf. The replacer is a fine white powder that you mix with a combination of hot and cold water (see procedure below). Think of it like making jello. The amazing thing is how it transforms once you mix it. The consistency changes so much that it’s easily used for meringues and filling cream. If you are not baking a vegan option see the notes below for the replacement. If you looking for a low protein option in place of dark chocolate, I have also found a lactose free or vegan chocolate option that also works. Read my review of ‘moo free’ chocolate for inspiration. I have also replaced the traditional heavy cream with my favourite coconut cream recipe; thereby making it suitable for vegans and lactose intolerant diets. For this particular cake I mixed in coconut yoghurt into the mix which gave it a lovely tangy quality due to the living enzymes found in the yoghurt. I also think this helped slightly with the over sweet nature of the meringues. If cherries are not in season, you could also replace it with any berry family. I think strawberries, raspberries and/or blueberries would be very nice. When constructing the cake, the tricky thing for me was taking the meringue disks off the baking paper without them breaking. You might want to make more than the required 4 disks, just in case you find some broken. In the end it didn’t matter that they broke because the chocolate and cream kept the stack together. Make up 200 ml of solution with 5 g / 1 2/3 tsp of egg white replacer powder whisked into 200 ml / 13 Tbsp water (8 boiling, 5 cold). Allow to cool. Whisk up on the highest speed for 10 minutes until starting to form peaks. Whisk in 200 g / 8 oz of caster sugar gradually for at least 10 minutes until the mixture is glossy and somewhat firm. The final mixture should be very smooth with no gritty sugar. Keep mixing on high speed to achieve the right consistency. Spread the mixture out on two baking sheets lined with baking paper and form four, 6-inch diameter disks. This can be done with a spoon or a pipping bag. Place the baking sheets in a preheated oven (250 F / 120 C) and bake for one and a half hours. Switch the oven off and leave the meringue in the oven for another hour. Make the cream (see recipe below) and set aside in fridge to thicken. This can be made the night before. Melt the chocolate in a bowl, set over a pot of gently simmering water and stir in 1/4 cup of the cream. Stir the chocolate and cream well until melted then remove from the heat and allow to cool slightly. Be careful not to split the chocolate. Once it looks creamy it is done. If the chocolate is split, don’t worry it will still work but it isn’t as pretty. Whisk the rest of the cream until thickened. 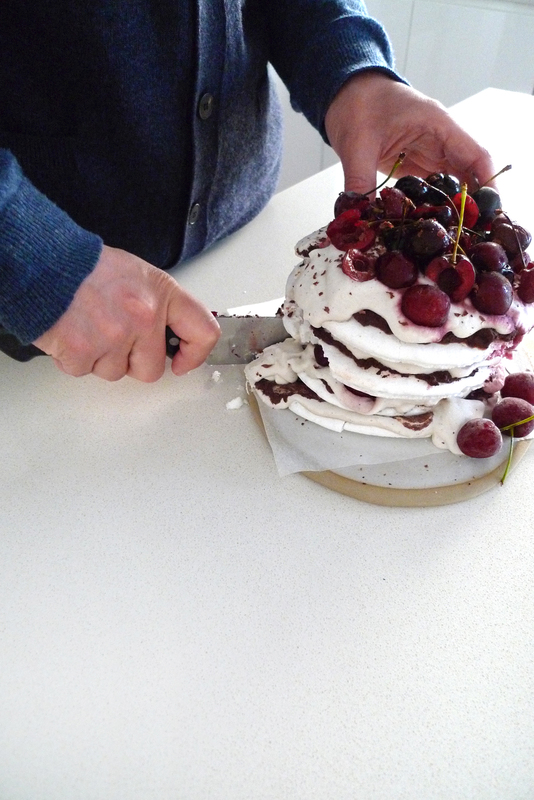 To assemble the cake: take one meringue disk and spread a quarter of the chocolate mixture over it. Spread a quarter of the cream over this and then scatter over the cherries. 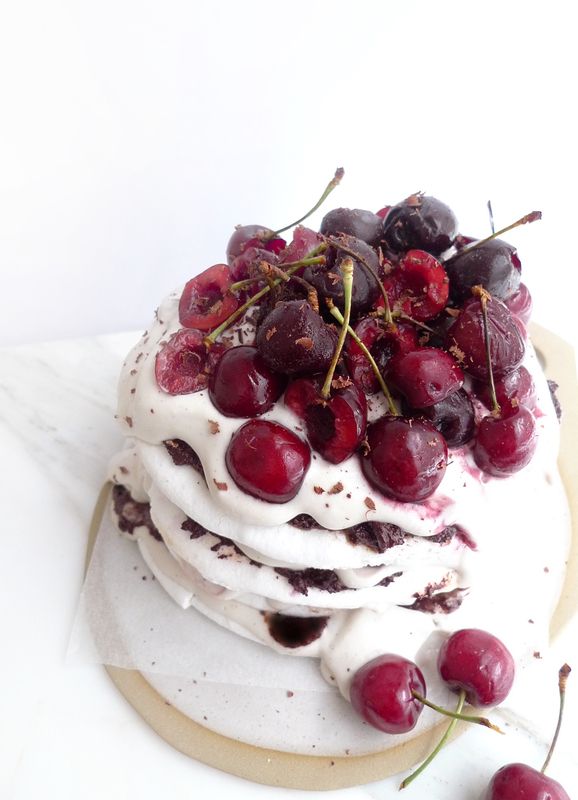 Top with the next meringue stack and repeat the chocolate, cream and cherry layering until you’ve stacked up all the meringues. 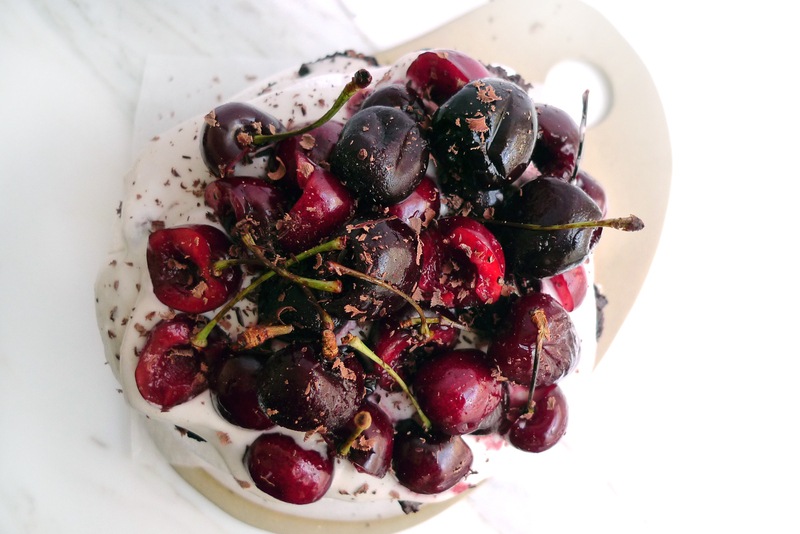 Add more cherries (some with stems for appearance) and grate a little extra chocolate over the cake for a finishing touch. – For a non-vegan option, use 5 egg whites in place of the egg replacer solution. 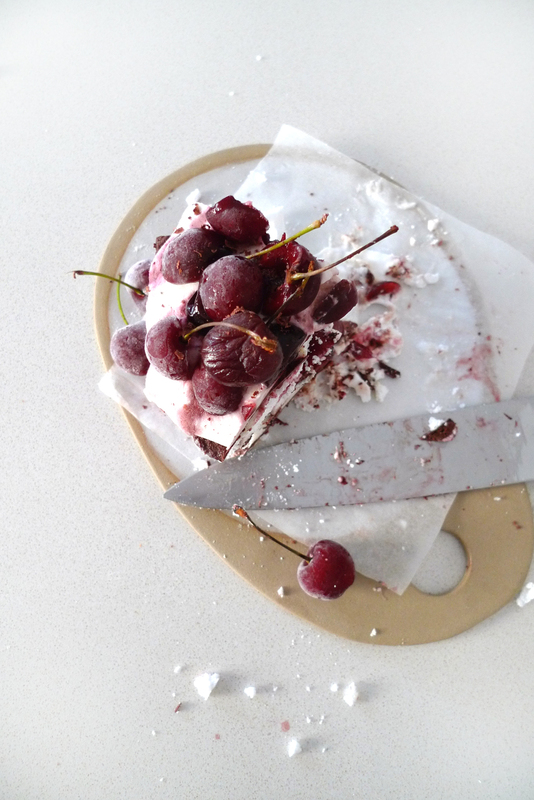 – According to the website where this recipe was adapted, there are two possible ways of serving this cake: You can either attack it with a sharp knife and a spoon, serving it in a messy pavlova style OR freeze the cake for an hour and then slice neatly with a sharp knife. I found that freezing it was a much easier way to serve it and kept all the layers together nicely. Cutting the cake one it was frozen was surprisingly smooth. Place the can of coconut milk in the refrigerator overnight to chill. Once the coconut cream has chilled, spoon the creamy white coconut cream from the top, leaving the milky water stuff behind (keep the water for smoothies, baking, or soup/curry). Beat the coconut cream with an electric beater until soft peaks form. Add the vanilla and maple syrup and continue to whip. Once it has reached whipped cream like consistency, place in the refrigerator until ready to use. I would love to hear how you go with making it less sugary. I try to avoid refined sugar too but haven’t quite figured out a good meringue recipe. Thanks! Wow you have a great blog! Thanks so much for your comment and the connection!